I won’t lie, I’ve been pretty darn excited about the Millennius Apanda from the moment I first read about it. Why? Because I liked the idea of seeing an Aussie company bring an Android Device to the market, something Kogan couldn’t quite do and let a few people down. Millennius however, have come through with the goods and were kind gave us the Apanda to review for you guys, and that’s exactly what I’m about to do. So let’s get into it! Editor’s note: This review was re-done after being told it was test software & a wipe fixed the lag I faced. The hardware design of the Apanda is simplistic and suits the device very well. There are 4 capacitive buttons located below the 3.2″ display that are responsive, although I did find myself sometimes hitting them when typing with the on-screen keyboard. These buttons are Menu, Home, Browser (?) and Back which are the standard on all Android phones, nothing is missing unlike the Galaxy S which only has 3 buttons. Search capabilities are also available when you long press on Menu which is a brilliant shortcut that I find myself using often. There are also call & end buttons, which I believe should be included on most if not all Android phones as most people are used to them coming from other mobile devices, so well done to Millennius for including them! Another great addition to the Apanda is the trackball, which is far, far better than the optical sensor things in the HTC Desire & Legend as you can easily navigate through text as well as it being crucial for a lot of games on the Android Market. I only wish it would light up when you received notifications, but hey we can’t have everything. The Apanda also has the dedicated Camera button for people who prefer to use it over the trackball or on-screen shutter button, I found myself using the trackball to take photos as it’s far easier and doesn’t move the phone about when taking shots, but more about the Camera later. Alongside the Camera button is the Volume Rocker which is quite tactile and works even when the display is off, so no need to play about with the phone to turn your favourite tunes up or hated tunes down. Also included is a 3.5mm which is a godsend for all Android devices or just phones in general. The Apanda is a great portable music player, it replaced my HTC Desire which I rooted and sometimes doesn’t recognise my earphones, none of those problems exist with the Millennius. The MicroUSB slot calls the left hand side of the Apanda home, as it sits under a very, very tight-fitting cover. You’ll never have to worry about dirt or grit getting into the connectors! On the rear is the 5MP Camera with LED flash that works well and you can check out some test shots below, as well as the loud-speaker, that is clear & quite loud, certainly better than that of the Sony Ericsson Xperia X10. Millennius have done a superb job with the display, first off, it’s not a QVGA display! It’s HVGA (320×480) which kicks some arse compared to that of the X10 Mini Series and the just release HTC Wildfire. This means that it’s perfect for mobile web-browsing as well as using all the available apps on the Android Market, as some of them don’t work with QVGA displays. The screen is responsive and features ‘Pinch-to-Zoom’ Multi Touch feature that people have come to know and love in the iPhone and high-end Android devices. To make things even better Millennius have included both a Proximity Sensor & Ambient Light Sensor to adjust your screen when it’s light or dark, as well as turning the display off when you’re on the phone to someone, so you’re not going to hang up on them. The Apanda is made for a sleek, black plastic, that reduces the weight of the device so it’s not too heavy in your pocket. Laggy. Jittery. Sluggish. 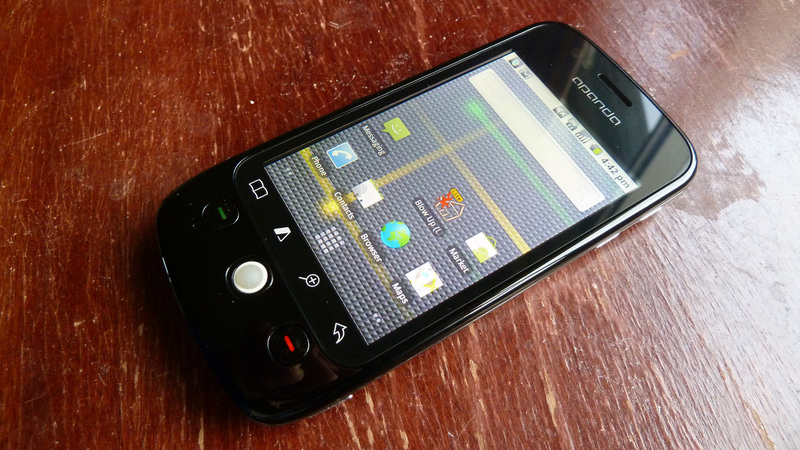 All these words describe how Android 2.1 performs on the Apanda A60. After getting in contact with both Neerav Bhatt & Millennius, I have found that my Apanda is running test software & after wiping the device, the lag was significantly cut back, yay! So disregard my complaining in the first review, I should have wiped it in the first place, apologies. The Apanda runs Android 2.1 which is equal to that of the HTC Desire, HTC Wildfire & Acer Liquid E, just to name a few. So the Apanda is certainly keeping up in terms of software and Millennius have even said that they’ll be upgrading the Apanda to Android 2.2 in the future, so you won’t be left behind. Android 2.1 enables hardware acceleration which on the Apanda means you can play some top 3D games without too much lag, whereas some of the leading competitors fail to do the same. It also includes Live Wallpapers, which surprisingly don’t slow down the system at all. But just remember, the Apanda is powered by a 600MHz CPU, although it feels as though it’s faster than that. One thing the Apanda can do is make calls, and I found no major problems in doing so. I was clear, the person on the other end was clear, everything’s good. I think it’s the most important part that your phone can actually make calls, and this phone actually can. I could cram in a full day of battery life, even after listening to a few Engadget Podcasts & songs. Non-stop music playback you could get maybe 8hrs+ with the screen & everything else turned off. The Millennius Apanda A60 is a phone that sets out to do the job it’s meant to, and that’s to be a Smartphone. And it does this well, all the needed hardware is there, the software is there and better than that of some of its competitors. The price tag is also less that most of its competitors. It’s just a simple, great phone. Does this phone have A-Tick certification? The phone might seem frugal but it is quite impressive, my friend works for Vodafone head office and apparently they are in talks with the manufacturer to take this phone on. Hey deano, did you publish a review anywhere of your first weekend with the Apanda? Am interested to know how this phone compares to the similarly priced HTC Wildfire. I guess the display is better (? ), but case & build quality is not as good. Biggest worry is whether the mob that Millenius imported this from will provide OS updates. I’m tending to think this phone is a bit overpriced and should probably be competing in the Huawei IDEOS bracket. Its on charge at the moment and will let you know when Im using it. It looks so bloody nice. For some reason I can’t do a reply to Deano’s last response, but I think he pretty much sums it all up with that eloquent retort, I mean, really who could argue with such strong points? I agree Deano. Can’t knock it til you try it. Even if you dont have 3G network for regional areas, Alot of those areas you would be in much anyway, at least you can still call and still use the internet. Even if not on 3G networks with any phone, the internet is still pretty good. Hey guys just wondering how you know it doesn’t work outside of metro areas? Do the other brands like samsung and htc from first models work in regional areas?? Yes, but it won’t work on Vodafone & Optus’s dual-band regional network..
What do you mean it wont work on vodafone or optus? It is a 3G phone so will work on all those networks. Is this phone compatible with Next G and the Optus and Vodafone dual band regional networks? Nope, just NextG. You won’t get Optus of Vodafone’s dual-band regional network. To get both 3g and dual-band on optus you’d need a phone with 900/2100MHz, right? For example, the SGS has 900/1900/2100 and it works on both, I think. Correct me if I’m wrong. ah i thought it was 8gb or 16gb internal. my god 150 bucks for 8 more gigs.. Yes it does. You get a 8gb or 16gb micro sd card when you purchase it. does it have a microsd slot? Ring Video Doorbell 2 — Australian Review · 7 hours ago. Massive Optus discounts: 80GB BYO plan from Optus for just $40 · 9 hours ago.